Family Hiking: Want a challenge? 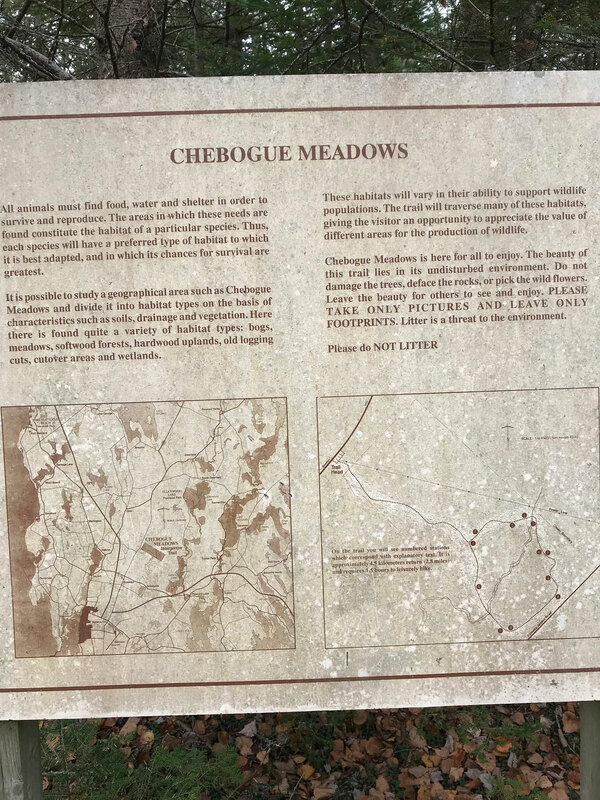 If your family is looking for a bit more of a hiking challenge, try the Chebogue Meadows Trail in Brooklyn. Expect rough terrain in spots. 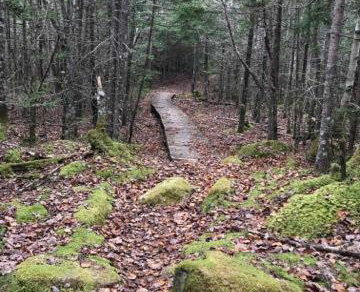 Chebogue Meadows Wildlife Interpretive Trail is a 4.5km hike. 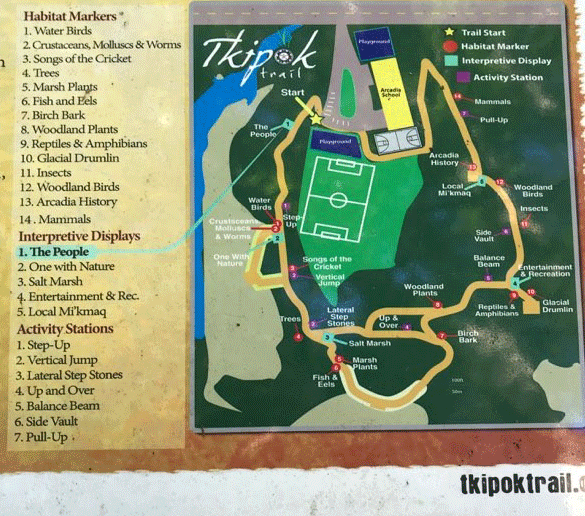 The trail consists of various terrains such as wetlands, rough footpaths (rocky), boardwalks (some in rough condition), and look-offs. There are signs along the trail with information of the trails surroundings. The trail is marked with yellow and red tree markers. 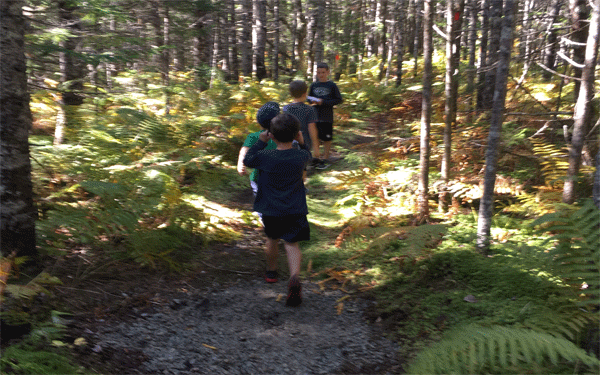 We recommend the buddy system because the trail itself lacks direction so a family hike with older kids is perfect. Don’t forget to wear orange this time of year and let us know in the comments how you enjoyed this trail! Whether you dance or just sit and listen, you are sure to be smiling! Journey’s Loren Fevens for this fun 50+ event! 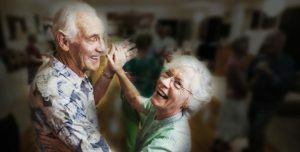 Dances take place from 6:30pm – 9:00pm, the second Thursday of the month October through April at the Lions Club Hall on Parade St. in Yarmouth. Enjoy the fully accessible venue, a wide range of refreshments and beautiful, fun music to dance or just sit and listen. Doors open at 6. Cost – $8.00 per person. Registration a must! Call Yarmouth Recreation at 902-742-8868 to get your name on the list for the next date! Please note: by selecting the date $8 is charged to your account and payable at the door unless cancelled in advance. Cancel by calling 902-742-8868 or email misty@district.yarmouth.ns.ca or comment below. Where to Walk or Hike this Weekend? Ellenwood Park of course! This weekend features a Family Campfire hosted by the Friends of Ellenwood Park. Join the Friends of Ellenwood Park for a family friendly Campfire and Marshmallow Roast. Come and experience a classic Canadian outdoor tradition. Park at the entrance gate and take a leisurely 15 minute walk along the main road down to the lake. Look for the children’s playground and you will see the ski cabin, the fire pit is just beyond. Newcomers to the area are most welcome! Marshmallows (halal) and toasting sticks will be provided. Bring a story to share and be sure to bring the kids! **This event is weather dependent and will be cancelled if it’s too windy or wet. 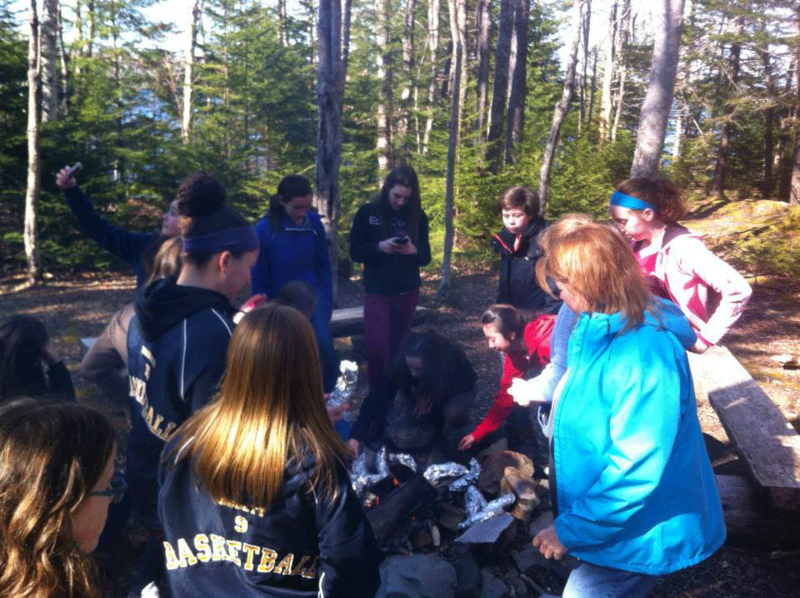 Ellenwood Park has an outdoor campfire area that you can use all year round! Bring the whole family and have an “I-spy” style scavenger hunt on the way in. Ask your children to name ten things they see that are red (or whatever colour you choose). This gives everyone a chance to have success plus you can keep moving along without trying to figure out one specific object. You can play this game any time your family is out for a walk in the neighborhood, hiking in the woods or even walking around an office building or mall while waiting for appointments. 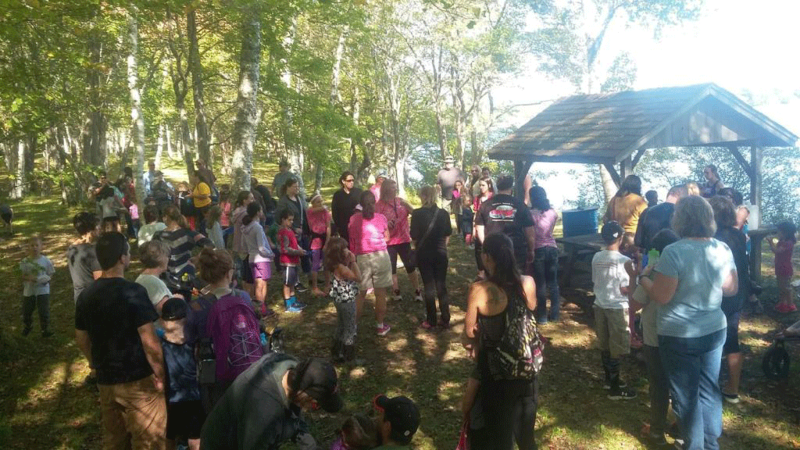 Over 120 people came out to Ellenwood Park Saturday to hike with their family! Thank you to all who came out to our Family Hike at Ellenwood Park on October 7th! 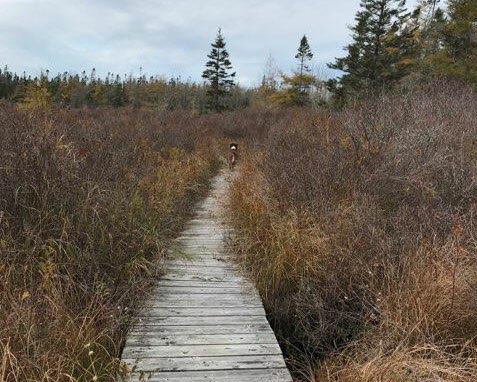 If you missed it, you can still get out and enjoy this trail year round. Ellenwood Park is closed for the camping season but that doesn’t mean you cannot walk in and enjoy the fall colours. 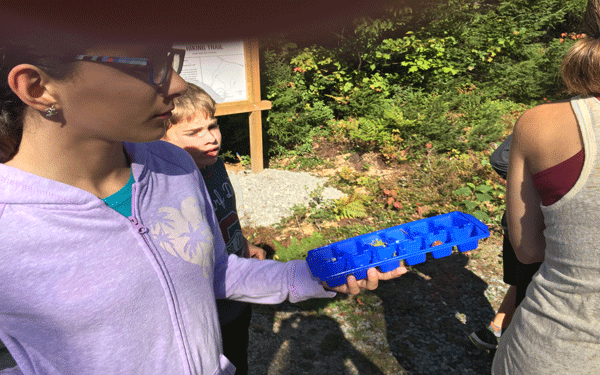 Looking for a great place to walk/hike/bike with the kids? While Ellenwood Park is officially closed for the season, everyone is still welcome to use the park. The Friends of Ellenwood Park operate programs throughout the fall and winter and when there is snow, open a ski cabin for everyone to enjoy! 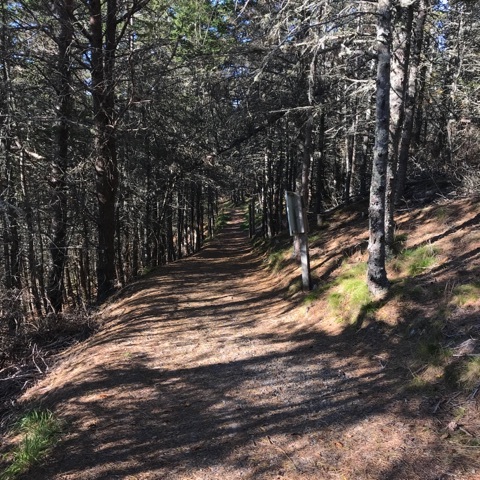 There is so much to do along the trail! 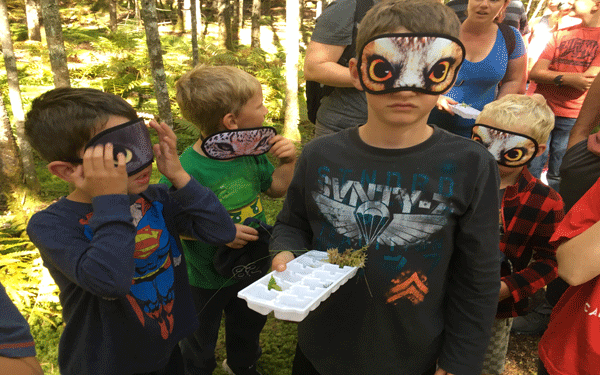 Did you know that the more your child spends time in nature, the better they will do in school? 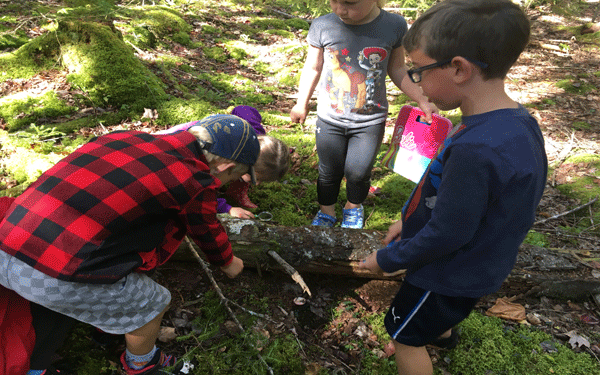 Research has shown many benefits to healthy child development as a result of nature-based play. 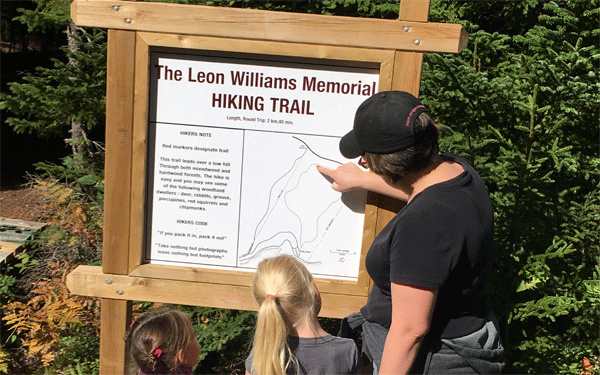 The Leon Williams Memorial Trail can be accessed near the end parking lot closest to the guarded beach. 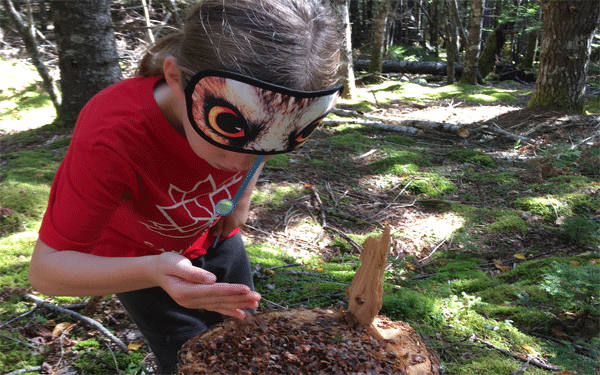 Hike through a traditional "Acadian Forest" of spruce, fir, pine,maple, birch, and hemlock. 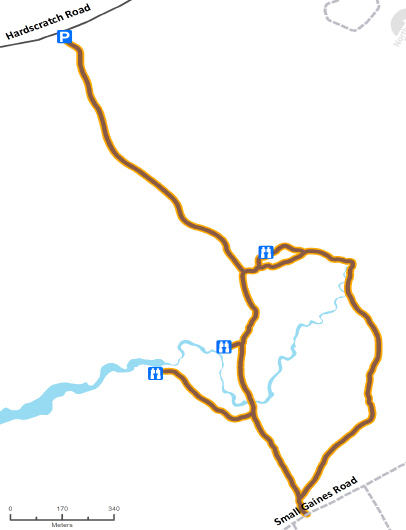 The 1.5 km trail is accessible to all ages. There are a few wet spots so wear appropriate footwear and strollers should be for trail use. Was this the squirrel buffet table? 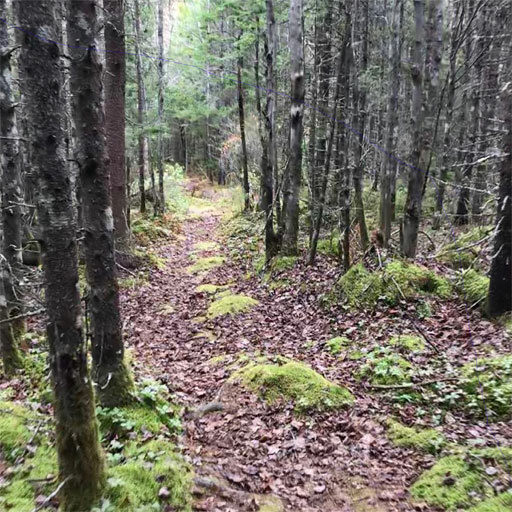 You will see squirrels playing and chirping, birds singing, woodpeckers knocking and if you are very stealthy, you might glimpse a deer, grouse or groundhog. Wear a sleep mask or just close your eyes and listen. How many sounds in nature can you name? The longer you do this the more you will hear! Have a contest to see how many you get to! Label an ice cube tray or egg carton compartments with words like soft, prickly, furry, sticky, etc. Try to find matching items and fill your tray. 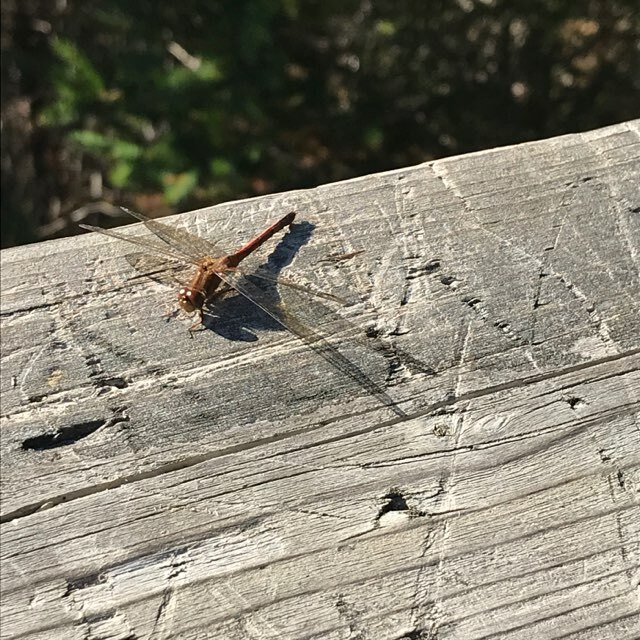 Take time to stop and look closely at nature. A fallen log provides a whole world of exploration. Bring small mirrors to look underneath and in small spaces and magnifying glasses to get even closer.